The 2018 C-USA Tournament is underway from Frisco, Texas. Below is the bracket, which will be updated as the tournament goes on. The first half of the opening round's games just concluded. The Roadrunners surprisingly strong campaign continues to the Second Round after setting aside their Texas rivals. UTSA will take on the high-scoring Marshall Thundering Herd tomorrow. Louisiana Tech vs. North Texas and FAU vs. UAB. Blazers led for the entirety of the game, aside from the opening few seconds when the Owls had a 1-0 advantage. UAB will face WKU Thursday night in the Second Round, less than a week after UAB beat the Hilltoppers in Birmingham. No. 4 Marshall topped No. 5 UTSA 95-81 in the quarterfinal round behind double-digit efforts from four players. The Thundering Herd will meet No. 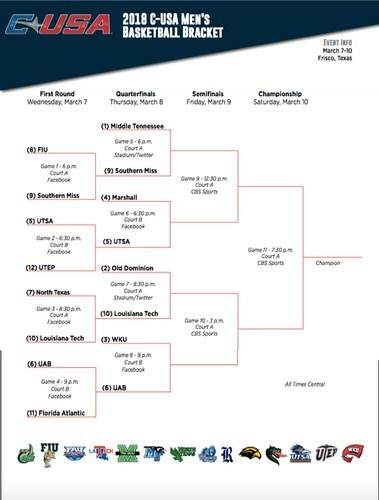 9 Southern Miss in the first semifinal matchup at 1:30 p.m. Friday. Bolstered by hitting 13 three-pointers, Southern Miss pulled off the dramatic upset, knocking off top-seeded Middle Tennessee, 71-68, in overtime in the quarterfinals. The ninth-seeded Golden Eagles (15-17) will advance to face Marshall at 1:30 pm on Friday. Brandan Stith scored 14 of the team’s final 19 points to lead Old Dominion to a 62-58 victory over Louisiana Tech in the quarterfinals. The second-seeded Monarchs (25-6) will advance to face WKU in the second semifinal at 4 pm on Friday. No. 3 WKU ran on all cylinders (57% FG) and silenced No. 6 UAB 98-70 Thursday night in the last quarterfinal game of the 2018 C-USA Men’s Basketball Championship. As mentioned previously, the Hilltoppers have a Friday meeting with second-seeded Old Dominion. Being new to C-USA, is it typically a 1-bid or multi-bid league? Sounds like many talking heads still believe MTSU will get into the big dance, meaning multiple teams from the conference make it. That is going to be bad news for some P5 school. There are 4 teams with 22 or more wins, so on the surface it would seem like more than 1 team deserves to go. In was in 2012, one of the final years of "CUSA 2.0." Both Southern Miss and Memphis made the tournament.